Because of our retail location, most people know us as a consumer transfer house, but we also provide services to videographers, photographers and ad agencies. These include transfers, editing, authoring & duplication as well as anything else that helps them deliver the final product. All of our professional customers have found that their time is better spent doing production, keeping clients happy, and getting new sales. We're here to make you look good. Your clients won't even know we were involved since your name appears on the final product. They'll just be impressed that you turned around a high quality job in no time. Contact us or stop by the store and we'll figure out a way to help. Has your deadline past? Need to have a finished DVD in the client's hand today? 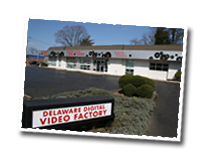 We are a short drive from Philadelphia, Wilmington or Baltimore. You upload your files, we download & make the DVD and arrange a local courier to deliver same day. It's Friday and you need 35 DVDs for a sales meeting in Chicago tomorrow? No problem! We will make the copies and drop ship for Saturday morning delivery. We are the "Video Emergency" experts!